At Four Winds School we start every day by reading a poem together. In observance of Black History Month, we have been reading exclusively poems by African American poets including Lucille Clifton, Maya Angelou, Langston Hughes, Gwendolyn Brooks, Rita Dove and Jean Toomer. When talking to an older child about slavery, Kendi urges parents to discuss the economic motive behind enslaving people. 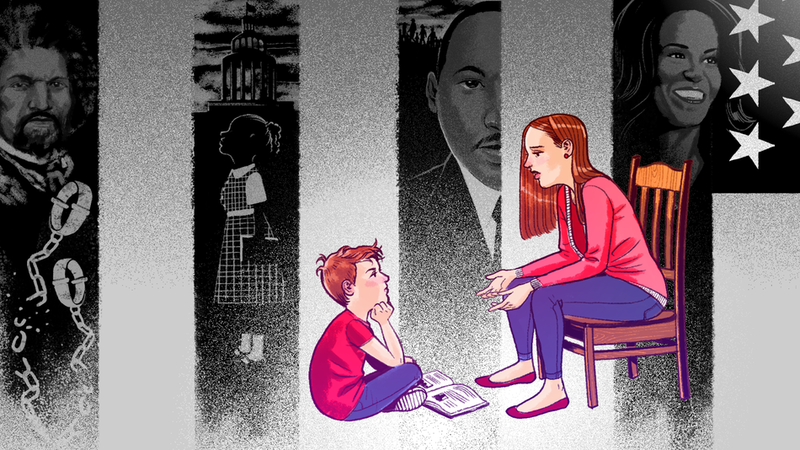 Identifying the role of a larger power structure means a child will understand that slavery wasn’t just about terrible slave owners but about a system that needed cheap labor to maximize profits. And when people challenged slavery, those making the profits defended it by saying that black people were better off in servitude than freedom. Image: Bob Al-Greene/Mashable. Click here to read more. Learn more about Black History Month at AfricanAmericanHistoryMonth.gov. 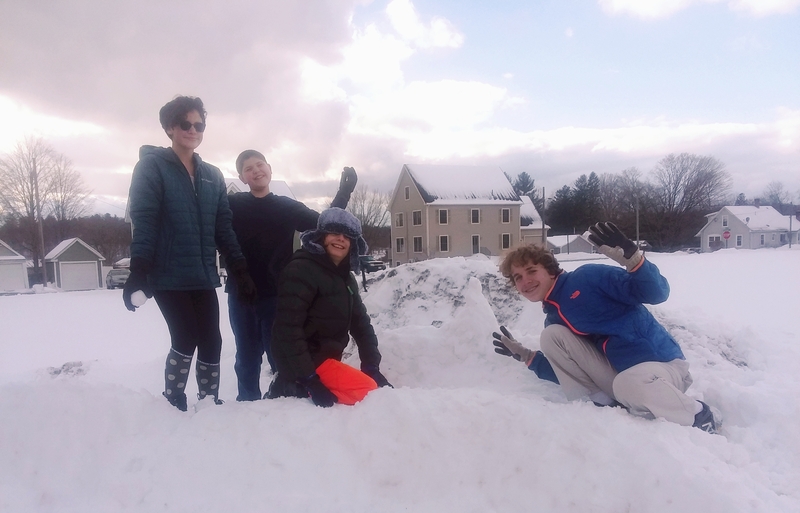 This week in humanities we’ll be finishing up “Part 1: Discovery” of The Mayflower by Nathaniel Philbrick and will do some pretty cool review activities before moving on to “Part 2: Community.” In science, students will continue to study heat and temperature. On Friday we will resume our “Field trip Fridays” with a trip to Historic Deerfield. The Board is conducting a branding and marketing survey. It’s short (9 questions) and anonymous, and asks some questions about what Four Winds is and does. If you haven’t already taken the survey from Facebook or another email, we would greatly appreciate you taking a moment to do so now by clicking the link above. Thank you for your input! We would also like the input of people on the perimeter or outside of our community. The idea is that if there’s a question that most people don’t know the answer to, then we need to advertise better in that area. Therefore, we would greatly appreciate if you would spread the survey around to people you know, such as coworkers, family members, and friends. You can send this link (https://www.surveymonkey.com/r/SNCYSLQ) by email, or share the post that is pinned to the top of our Facebook page. Thank you so much for your help! 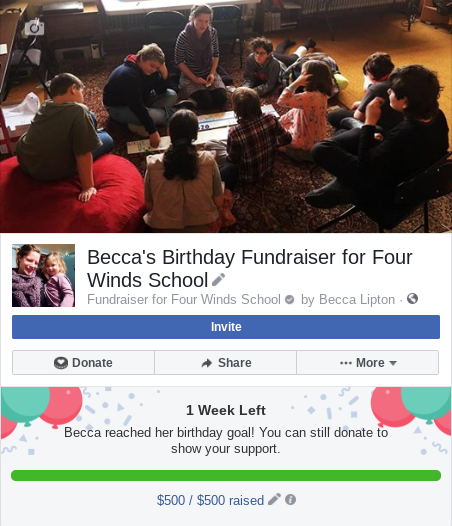 In just one week, Becca’s Birthday Fundraiser on Facebook has raised $500! The proceeds of this fundraiser will all go directly to our Summer Writing and Art Camp! There is still one week left of the fundraiser, so please feel free to share it and spread the word! Spread the word, like us on Facebook and Instagram, or click here to donate! Thank you! Four Winds School is a 501(c)(3) non-profit organization and all donations are tax deductible.